After a few months back home in Colorado, I have once again returned to Minneapolis—not to school this time, but rather as the first (read: only) AC for the feature film Last Breath, a sort of post-apocalyptic road movie written and directed by Ian Hansing. Production starts tomorrow. By industry standards it’s a tiny production, but it’s still far bigger than pretty much any film I’ve ever worked on, and all the department heads are really incredibly on top of things. It’s a little intimidating being in charge of the camera department (read: being the camera department) for a real feature with a sizable crew and truckloads of equipment rentals and all that jazz, particularly given that I haven’t AC’d anything in several months, but I’ve been getting my mojo back; labeling cases, buying a 100′ tape measure (finally), and getting down and dirty learning the film community’s own convoluted phonetic alphabet used for slating takes (similar to but not the same as the NATO phonetic alphabet, it begins with ‘apple’ instead of ‘alfa’ and ends with ‘zebra’ instead of ‘zulu’). I’ll be reporting directly to cinematographer Matt Kane, who you might remember as the übermensch who shot Discouraging Words, and I’ll get a chance to hang with a few legends of the Minneapolis film world, so I’m pretty excited even though I have to wake up around 3:30 tomorrow for the long drive out to the location in time for the 5:30 crew call. So expect to hear more about all this. In a day or two, if I can summon the energy, I may give you all a peek inside those cases. 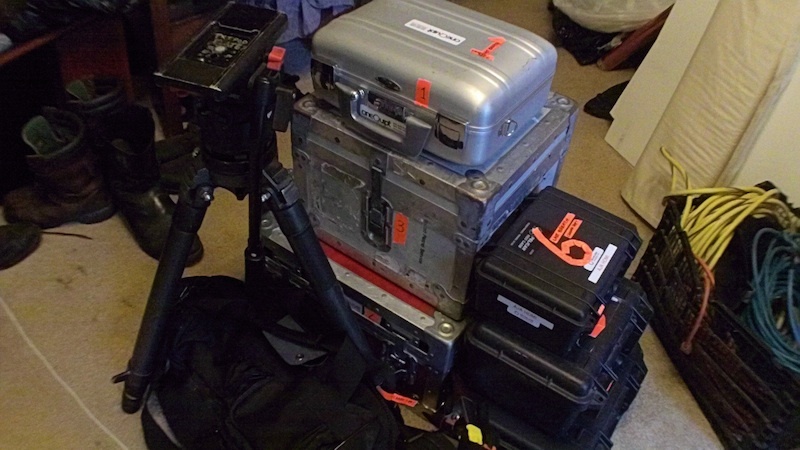 For now, let’s suffice it to say that we’re shooting digital and I’ve got lots of toys to play with.